Introduction: Scott Phillips is a genealogical historian and owner of Onward To Our Past® genealogy services. In this guest blog post, Scott turns to old newspapers to research the history of St. Valentine’s Day—and shares a personal Valentine’s Day story. Nothing much beats holidays as a way to get everyone talking about family, memories, stories, and family history. Certainly Valentine’s Day is no exception! I’ve been blessed to have my “Valentine” with me now for over 38 years and I sure am glad she said that she would be my valentine all those years ago. In the case of my wonderful wife, each year about this time I would go out to find one of those fancy satin hearts filled with chocolates. Why? Well, when we were dating she told me, very early in our relationship, “I’ll know the man who really loves me because he will buy me one of those fancy hearts filled with chocolates for Valentine’s Day.” Needless to say I bought one for her every year after that. Every year, that is, until recently when she said to me: “OK honey, I know you love me so you can stop now.” So now I have to be creative and come up with something new and different each Valentine’s Day. That got me to thinking this year about what the history of Valentine’s Day was, what gifts might have been like in the past, etc. I admit I never really knew much about this holiday, so I gave GenealogyBank.com a look for some information about this romantic day and maybe even find some potential ideas for my wife’s gift. My first hit helped explain the history of the Valentine’s Day holiday. 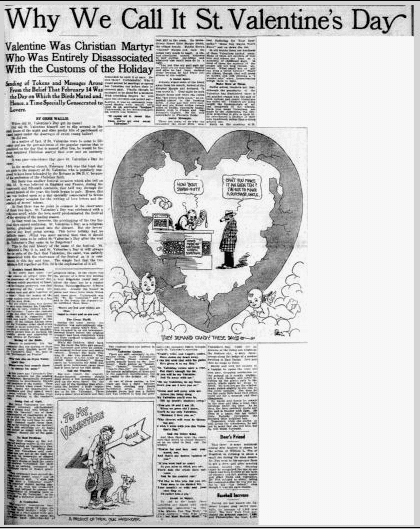 There in a 1925 newspaper was an intriguing, full-page article describing the origins of Valentine’s Day. The first thing I learned was that it is actually St. Valentine’s Day, named after the long-ago martyred Saint Valentine. 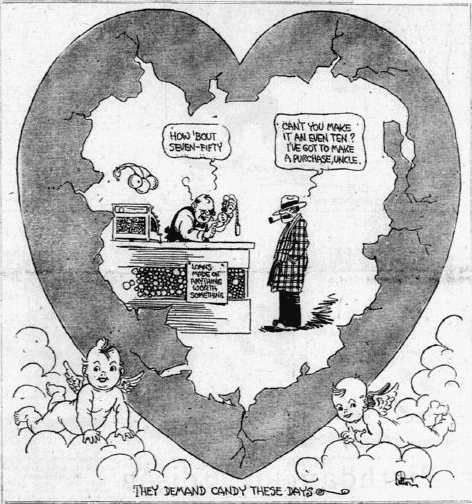 I certainly appreciated one of the cartoons that accompanied the old news article, even if I have been lucky enough to never have to visit a pawnshop prior to my shopping trips for chocolate-filled hearts. 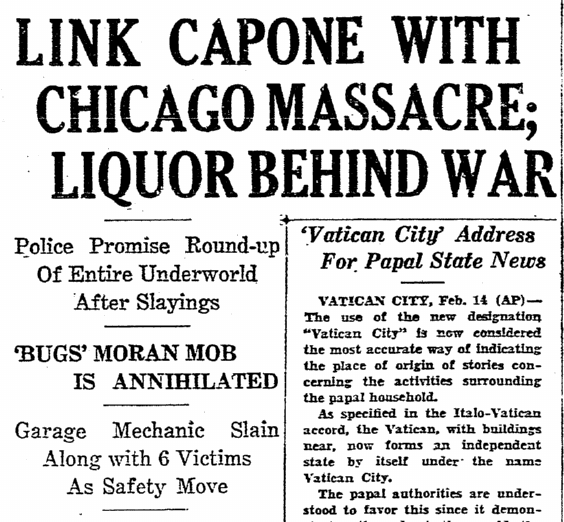 My next hit was closer to my adopted hometown when I saw the byline of Chicago, but alas this 1929 newspaper article was about the infamous St. Valentine’s Day gangster massacre. Ugh…not romantic in the least, although it is a very interesting event in our national history. So I was off in search of more newspaper articles about Valentine’s Day. 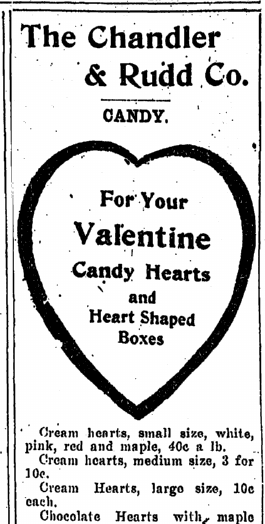 I smiled when I saw that the price of satin heart boxes ran from 20 cents to $4, but it was the name of the company that ran the advertisement, The Chandler & Rudd Company, that actually caught my eye. You see back in 1910 my great grandfather, Frederick George Evenden, was a Master Tea Blender for none other than The Chandler & Rudd Company. Yep, the very same company as the one in the advertisement—and during the time that he worked there. So for all these years my buying chocolate-filled hearts was simply karma! Karma sent from my great grandfather to my wife, giving her vibes to instruct me to go for what he personally knew was the really good stuff for Valentine’s Day! Sadly, Chandler & Rudd closed just two years ago, but if they were still open I’d be on the phone with them right now to buy her a sweet bit of the past. So with a tip o’ my hat to my great grandfather Evenden, this year I am going back to getting my Sweetie some of those fancy chocolate candies in a heart-shaped box this Valentine’s Day for sure. Happy St. Valentine’s Day to you and your family! Do You Know Where in Ireland Your Ancestors Came From?